Traditional St. Brigid’s cross is made in Ireland from genuine straw-like rushes. 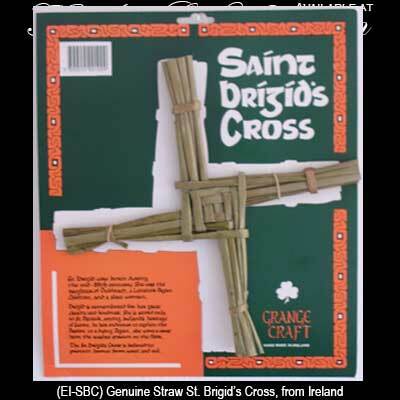 Sorry, this straw St. Brigid's cross is out of stock. This St. Brigid's cross for the wall is made of traditional straw and measures approximately 9 1/2" wide x 9 1/2" tall; no two are identical. The St. Brigid's wall cross is made in Ireland by Grange Craft and it is complete with a St. Brigid's history card, complements of The Irish Gift House. St. Brigid’s cross is a traditional design that is made in Ireland from genuine straw-like rushes.